When the Republic of Palau’s new marine sanctuary law takes final effect in 2020, the country will have the sixth-largest fully protected marine area in the world. A 500,000-square-kilometer area within the western Pacific nation’s exclusive economic zone (EEZ) will be closed to all export fishing, drilling, and mining to protect the health of the marine ecosystem and its fishing stocks. But a sanctuary is only as good as its enforcement. How does an island nation monitor an expanse larger than the state of California with limited surveillance resources? A research team from the California-based Scripps Institution of Oceanography has found a way to use satellite observations of dynamic ocean conditions to predict zones of probable fishing activity, which can then be used to direct sea and air patrols of the protected area. By government regulation, foreign fishing vessels operating in Palau’s EEZ must carry a vessel monitoring system (VMS) to track and report their movements to a VMS officer with the government’s Marine Law Enforcement Division. The information is used to manage fishing activity and is archived over time. Eric Terrill, a researcher at Scripps and leader of the new project, has been working with the Palau government for years on marine management programs and saw a new application for the VMS record repository. “It struck me that there was a treasure trove of information in these data that we should explore with modern big data analytic techniques,” he says. The Scripps team first examined more than one million VMS records collected between 2011 and 2016. After filtering out transiting vessels from real fishing activity, they matched the information with satellite data on localized ocean measurements taken during the same time frame. The researchers looked at information on chlorophyll concentrations, and water velocity, temperature, depth, and density. “We used all the available environmental data we could get our hands on that are associated with fisheries,” says Cimino. The team’s final step was to develop and evaluate several mathematical models that compared their oceanographic measures to the presence of fishing vessels and to the number of fishing days spent in each location. The results effectively captured both the spatial distribution and the seasonal variability of the fishing activity and how it correlated with the ocean conditions. A prominent El Niño that brought warmer waters to the western Pacific between 2014 and 2016 helped to confirm the Scripps team’s models by demonstrating how rapidly fleets respond to changes in ocean conditions in the search for good fishing grounds. “The study demonstrates a new, powerful application of VMS data,” says Vanessa Jaiteh, a fisheries scientist at Palau’s Ministry of Natural Resources, Environment, and Tourism who was not involved in the research. Steve Murray is a freelance science writer based in San Diego, California. 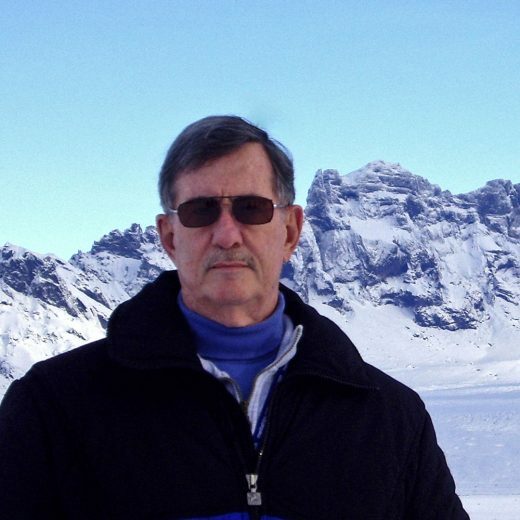 With careers in aviation, engineering, and teaching behind him, he now writes about space science and the environment. His work has appeared in Earth, Astronomy, and World Archaeology. Cite this Article: Steve Murray “How Do You Surveil One of the Largest Marine Protected Areas on Earth?,” Hakai Magazine, Apr 10, 2019, accessed April 23rd, 2019, https://www.hakaimagazine.com/news/how-do-you-surveil-one-of-the-largest-marine-protected-areas-on-earth/. A remote camera on a nearby hill spies fishers ignoring the rules in an Australian no-take zone.